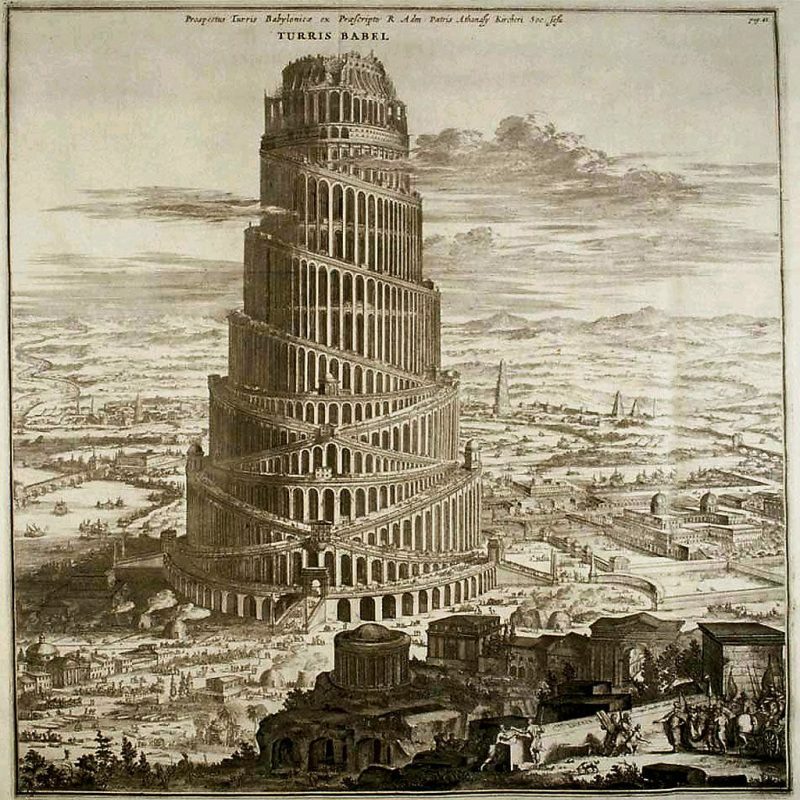 The Tower of Babel, God's-eye view. Noah’s boys had a lot of children, and over the next couple of centuries they constructed all of civilization on the Fertile Crescent. Among Noah’s grandchildren was Shem’s boy, named Nimrod, who, perhaps driven by the trauma of having such an unfortunate moniker, was driven enough to be the first king, setting up shop in Babel. “We’re proud to be Babelonian,” said these people, who were caught up in a patriotic fervor. They set out to build a tower that reached the heavens, somehow afraid that if they didn’t have such a tower, their unity would come apart. God came down from the heavens to see what was going on. “This unity is a problem,” God said. “I need to do something about that. United, they can accomplish anything, and I don’t want that. Probably better that they don’t.” So God invented new languages, splitting up the groups, rendering them unintelligible to one another. The people couldn’t comprehend one another, so they appeared to just babble on and babble on, which is why this country came to be known as Babylon. Oh, and the tower never got finished.